Join Ira McNamara and experience one of the fast growing exercise programs on the globe! Arrive at 6pm at The View Winery & Vineyard. Check out the shop, chill at the picnic tables get to know your pound posse tribe! At 6:30 we set-up and ROCKOUT! It is time to make some noise in a 45 minute POUND Rockout Workout Class. 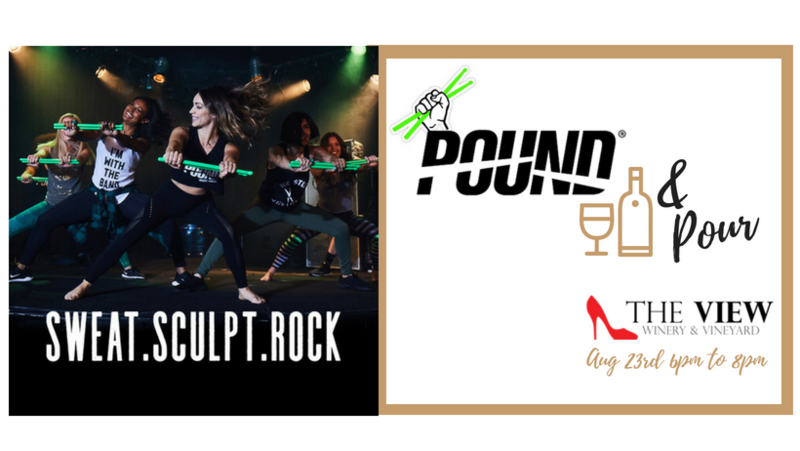 POUND is the world’s first cardio jam sessions inspired by the sweat dripping fun of playing the drums! But that’s not all after we POUND we stay for a POUR. Your ticket includes a tasting!!! Come check out the first POUND and Pour event here in the Okanagan. A fun, out of the box way to get in some exercise and remind ourselves that life is about balance and the people you get to do it with!!! Space is limited. We anticipate this event selling out so ensure you grab your ticket today. EMAIL ira@cornerstonefitness.tv to be added to the waiting list. NEW FALL EVENT DATES COMING SOON! !